While the world is seemingly full of available USB ports and wall chargers, somehow it's always missing the appropriate cable when you need it. 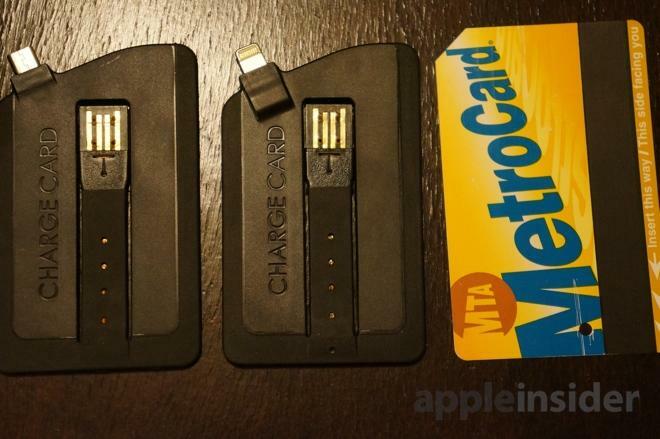 Enter the Charge Card: a flat, credit-card-sized USB "cable" that can be easily carried in a wallet, and now supports Apple's Lightning connector. 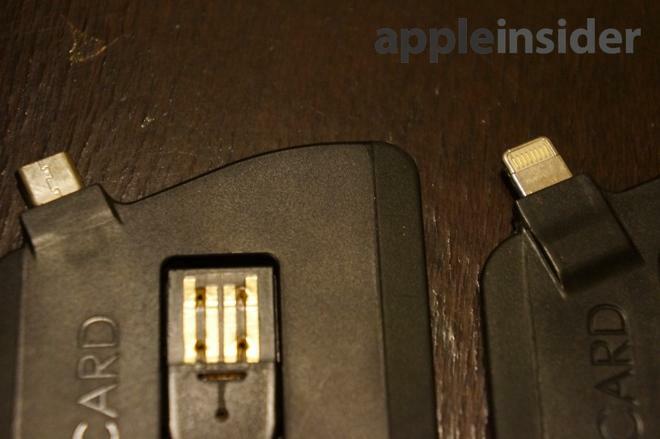 Until recently, the Charge Card has been available with support for Apple's legacy 30-pin dock connector, as well as micro USB for non-Apple devices. But now the Charge Card is also available with a Lightning connector, reasonably priced for $25. The design of the Charge Card is as advertised: Completely flat, just 3 millimeters thick, and featuring a thin USB connector that pops out of the center of the card. Once snapped out of place, the USB plug can be positioned to either side of the card, thanks to a bendable rubber coating that protects the cable inside. The card, which is manufactured in California, is thinner than three credit cards with raised numbers stacked on top of one another. It will most likely be the thickest item in your wallet, especially if you don't carry a lot of cash, but that's not to say it's a noticeable or hefty accessory. The Charge Card is the same width as a credit card on its short side, while the height, or long end of the card, is slightly shorter than a standard credit card. The Lightning connector protrudes from the top of the card at an angle. The Charge Card with Lightning connector is largely identical to its micro USB counterpart, with the plugs located in the same position. However, the plastic on the Lightning card does get noticeably thicker next to the connector, while the micro USB card does not have that same thickness. Frankly, this difference is minor, and won't be of notice when carrying the Charge Card in a wallet or otherwise. The construction of the accessory does not cause us any concern. 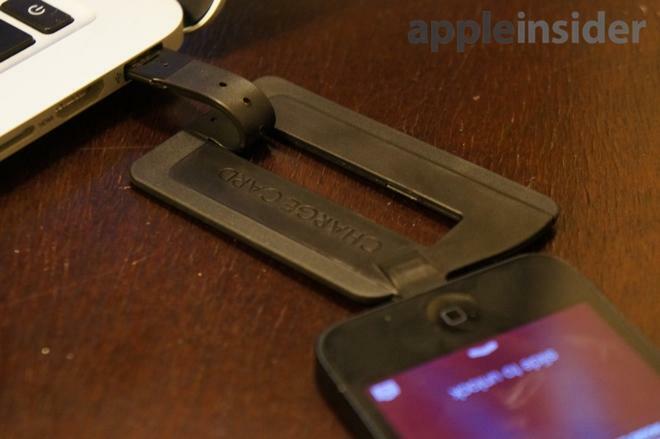 Though the USB connector portion bends, the rubber cover is more than strong enough to hold up the weight of an iPhone 5 on its own. The Lightning connection is also snug and, in our tests, could also hold the handset on its own  though we don't recommend putting this to the test from high places. The plastic body is also sufficiently hard and seems relatively durable in our tests. This will be particularly important for users who carry their wallet in their back pocket and may sit on it from time to time. While we didn't put the Charge Card through an extensive stress test, we feel confident in saying it will withstand most traditional day-to-day use. The Charge Card works as advertised. 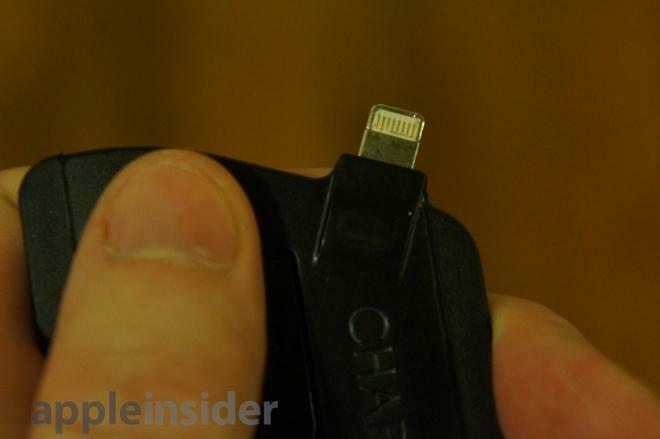 It's a portable USB cable that's capable of sending power to a Lightning port on an iPhone 5. 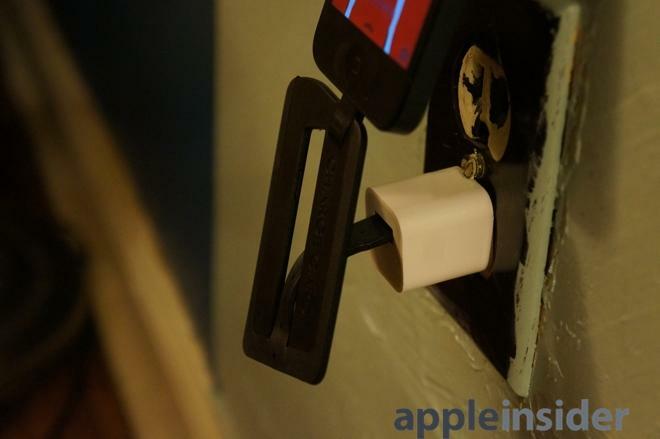 In our tests, the iPhone charged just as quickly as it did with a standard, official Apple Lightning USB cable. 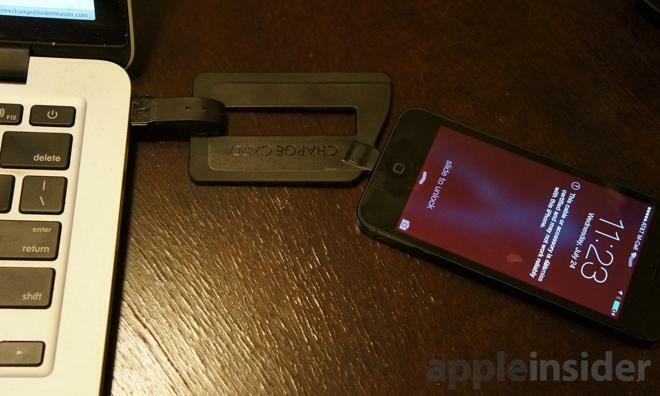 It should be noted that we did receive a warning that our accessory was not certified when the Charge Card was plugged into an iPhone 5 running Apple's pre-release iOS 7. This prompt did not appear on an iPhone 5 using iOS 6. The prompt for uncertified Lightning accessories has appeared in iOS 7 since the first beta was released in June. Really, the only downside to the Charge Card is a function of its compactness: When plugging in a device, the card doesn't give a lot of room to work with. Attempting to plug in an iPhone 5 to a wall socket requires a delicate balancing act between the wall charger, card and phone that quite frankly we can't recommend. As such, the Charge Card is best used with a wall USB adapter plugged into a surge protector or extension cord, or a direct USB port or hub available on a flat surface. But really, it's hard to take issue with this limitation, since the entire point of the Charge Card is the convenience of its compactness. The Charge Card is a device that you can simply leave in your wallet and never have to think about. And then, in that inevitable instance when you don't have a Lightning connector available, it'll be your dependable standby. 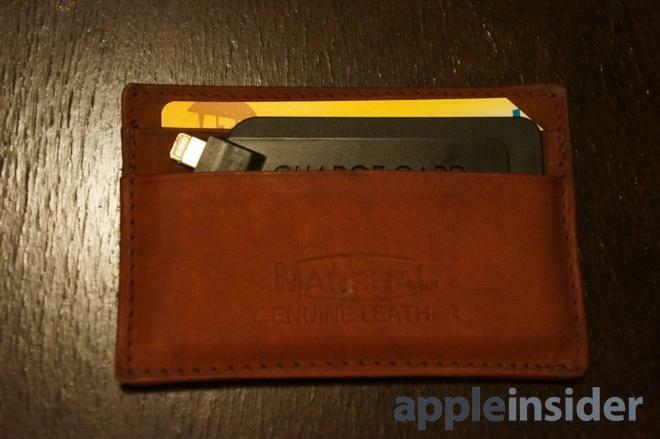 The Charge Card does everything its makers claim it does, and it does it well. If you're looking for a portable, flat charging "cable" that you can carry in your wallet, this product is easy to recommend. Note: This review unit was provided by BiteMyApple.co, a marketplace for dozens of other Apple accessories, which sells the Lightning Charge Card for $24.99. Versions of the accessory with Apple's 30-pin adapter for legacy iPhones, as well as micro USB for Android phones and other devices, are also available for the same price. Rumor: Photo may show retail packaging for Apple's low-cost "iPhone 5C"